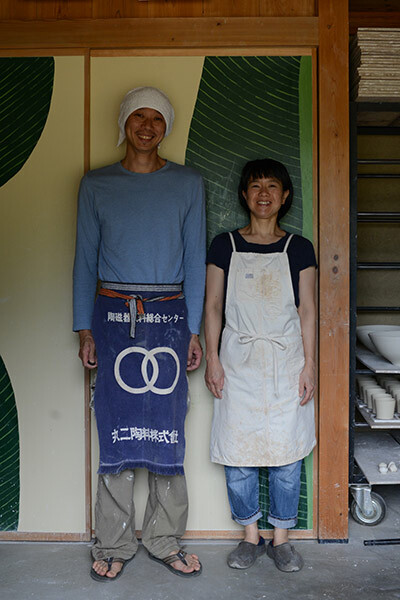 The Otani Pottery Studio was started by Tetsuya and Momoko Otani in 2008. 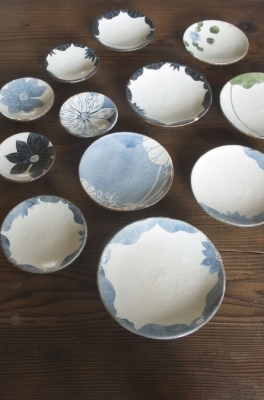 It is located in Shigaraki, one of the 6 oldest pottery sites in Japan. Each of our works are completely different in styles. 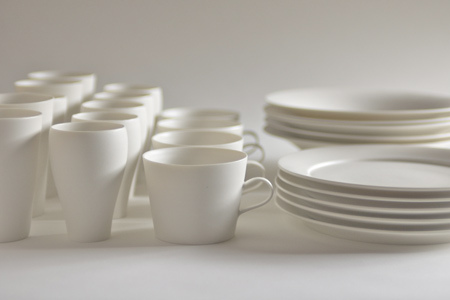 Though different in styles, we both focus on making functional wares. The ideas and designs behind most of our pots develop from small ideas we come across in our daily lives. We also make collaborative works when we have joint shows. and enjoying the company of friends are some of the things we cherish most. We happily live in the middle of the mountains with our 3 daughters, 2 cats, and 1 dog. We would love to have more opportunities to exhibit our works outside of Japan. I make porcelain table wares, vessels, heat-resistant cooking wares (pans), lampshades, and clocks. My works are all made by the wheel-throwing process. My first thought for the designs of my work is that they be functional. I like my works to be easy to wash, easy to store, and to look nice on the table. in what kind of situation or occasion it will be used (family or single meals, parties, and so on), and I aim to design shapes and sizes that fit well in our lives. My works may at first glance give the impression that they are a bit inorganic (cold or austere); however, as you look closely, you can feel the soft lines and warm touches of glaze that can only be created by hand. I think "simple, beautiful and functional" things possess real beauty and we will never tire of looking at them. These are the types of things I am trying to make with my own hands. I love daily kitchen life: cooking, eating, drinking and so on. I think most of my works have been born of my kitchen time. I always imagine that the sizes will fit some specific food or drink, and the way the works will look when we put something on/in the plates, cups, and bowls. I believe that nice functional wares make our daily life rich and fruity. Some people who own my work tell me that it has a warmth and depth that they enjoy holding in their hands. the lives of those who use my work.